With advancements in generative design, software algorithms, and robotic construction, our current processes are going to be changing quite a bit over the next three to ten years. We will see more and more done by computers and machines than we have ever seen. Rather than Building Information Modeling (BIM), we are going to see Building Information Optimization. Rather than manually drawing walls, doors, and columns for what we think is a good design, we will feed the computer “rules” instructing it to give us a building’s optimal footprint, structural load capacity, and thermal performance. Things that took months will be done in a day. What does this mean for you? How do you play a part in these changing processes? 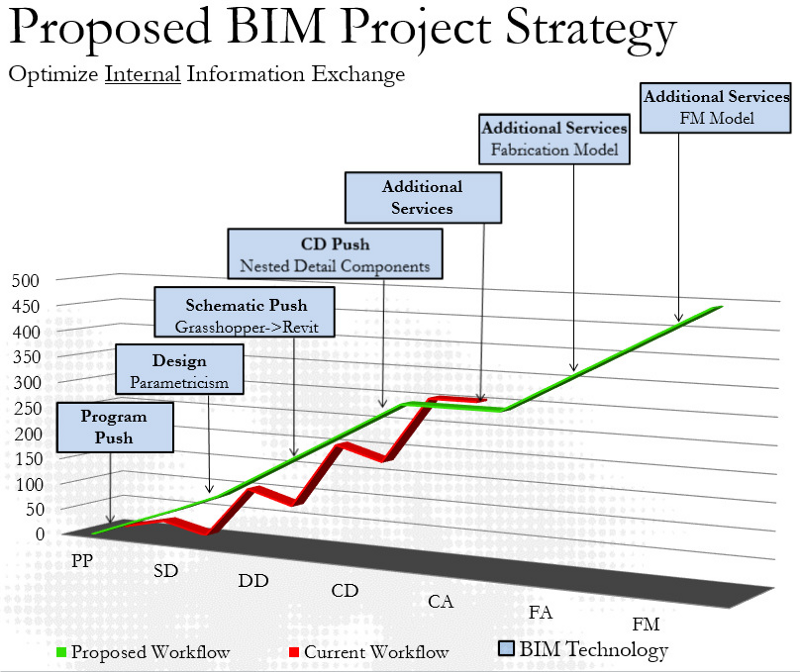 Most firms currently using BIM software are focused on gathering data. We design buildings manually, enter data manually, and then print data manually. This system works for the most part; however, it’s not very efficient. By the way, most firms are not even executing this process very well. Most firms are using their BIM software like it’s a CAD program. 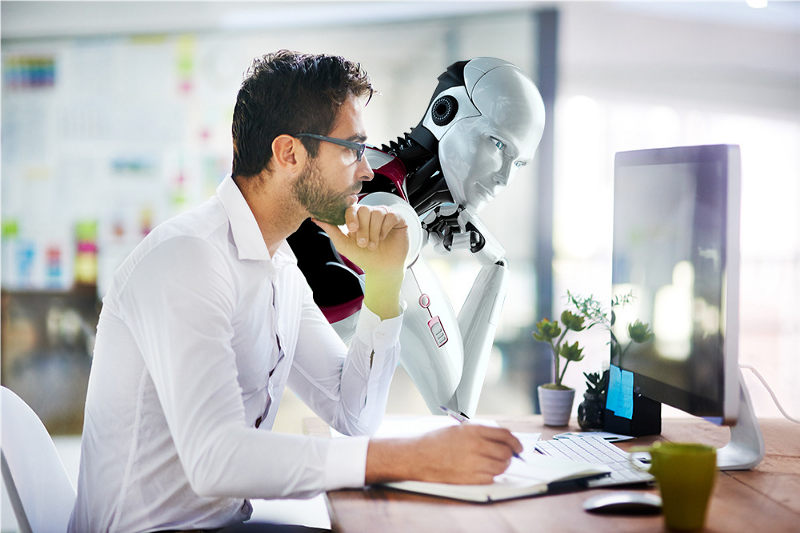 In his book, Rise of the Robots: Technology and the Threat of a Jobless Future, Martin Ford discusses how software algorithms and robots will be replacing lower paying jobs such as fast food attendants as well as higher paying jobs such as writers and legal professionals. What patterns are you seeing in your own industry? What place might robots and algorithms eventually have in the office and in the field? Pindar Van Arman, a technology artist and software engineer, has built a robot that can paint art. Van Arman, who is an avid painter himself, first built the robot as an assistant for his personal projects. Now the robot can make beautiful portraits and landscapes, either with the assistance of a human or entirely on its own. Here’s another question for you: Can an algorithm design a building? Can a robot construct a structure? If a tool doesn’t exist or if there is a limitation in a program, we now can create our own tools. This capability has existed with things like Lisp routines in AutoCAD, and Dynamo for Revit. If you haven’t jumped on the Dynamo bandwagon yet, you need to. How does design happen at your office? Is the design typically modeled in a static design software like Sketchup? Of course the nice thing about conceptual modeling software is that you don’t have to think as much about assemblies, materiality, etc. What if we could make multiple design iterations in a conceptual tool without having to remodel our buildings every time there was a change? The most obvious advantage is the efficiency of not having to remodel over and over again. We can create multiple iterations very efficiently. FormIt is another conceptual modeling tool. One nice advantage about FormIt is the ability to plug and play with Dynamo (pun intended). Below is a building someone on our team modeled using FormIt. In the future, rather than gathering data and reporting on that data, we will use data to inform our designs. We can use Parametricism plus BIM to help us problem solve. One of the challenges I had with this specific design was to rationalize the radius such that the panels would divide evenly and stay planar for the fabricator. The way I problem solved this was thinking rational form=rational panels. Using data and math I was able to achieve this goal; however, the family was rigid and not intuitive to edit. I later started getting into algorithmic editors like Grasshopper and Dynamo. Here is the same example; however, notice how easy it is to edit the geometry, and I can constrain the panels and keep them planar! As tools become easier to use, we will see a wider adoption rate. Below is an example of a piece of furniture that I helped work on. Notice the multiple options we are able to create extremely efficiently using algorithmic modeling. I authored an algorithm that created and numbered a template for each carpet tile. Notice the number “0” for the first one. Using technologies like CNC (Computer Numerical Control). This means a computer converts the design produced by Computer Aided Design software (CAD), into numbers. The numbers can be the coordinates of a graph and they control the movement of the cutter. In the past if we asked a human to cut these beams, the price would have been more expensive given the complexity of the templates and the form. However, if we are using a CNC to cut straight beams or curved beams, the price is the same. But what happens to the job of the traditional fabricator? Does the machine replace him? No. He now operates and maintains the machinery. The machine and the craftsman become an integrated team. Everyone has heard of construction waste. It’s basically the result of trimming excess material while constructing a building with the waste essentially being destroyed or placed in a landfill. What is data waste? Data waste is the process of not using data or recreating data through a building lifecycle. We do this all the time. What happens when you receive a space program done in Excel with all of the programmatic information including required area, affinities, departmental adjacencies, etc.? If you are like most firms, you will either print out the Excel form or have it on your second monitor while you design in Sketchup up or Revit. There are plenty of Revit Excel import/export add-ins, and there is no reason we should be recreating the same data that is in Excel, in Revit. These tools can and should talk to each other. What design tools do you use? If you are like most firms, you are likely designing in Sketchup, and maybe a little bit of FormIt or Rhino. What happens when you get to design development? Are you recreating the model that was in Sketchup in Revit now? Notice the data drop? 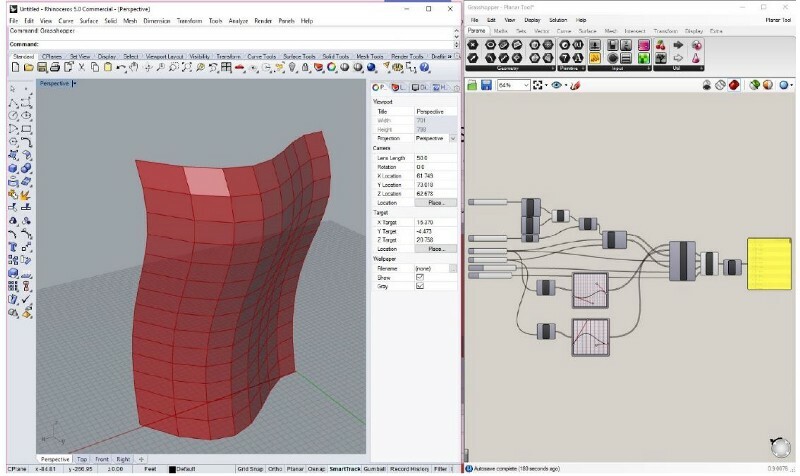 What if you could hit a button and it would translate your model from Sketchup/Rhino to Revit? 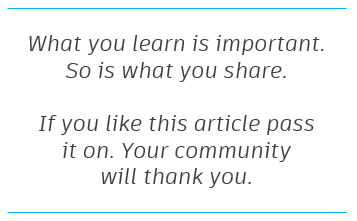 In the future we will not spend months translating information from one software to another software. I envision in the future, the cloud will be software agnostic, and we will be able create, manipulate, and capture information regardless of what software the geometry was created in. This is where it gets exciting…computers will be able to be fed a set of tasks, rules, and processes and be able to execute them autonomously and more efficiently than humans. We see hints of AI BIM today. Do you enjoy manually creating PDFs, exporting DWG files, and detaching Revit models? In the very near future, you won’t. This is available now. IMAGINIT’s product clarity automates tasks such as printing, publishing to Navisworks, and creating room data sheets. The ROI is ridiculous. Imagine if the computer knew when milestones were, when the model changed, and being able to react by exporting the information for the consultants. Take it another step further. What if all modeling was done in the cloud, and you had live PDF sets. Every time a change happened, your PDF updated in real time. It’s not that hard to imagine given where we are today. The traditional 3D coordination/clash detection process is about to get an overhaul. Building System Planning, Inc., has an Auto Route Feature tool called “GenMEP” (Generative Design MEP). Imagine a tool that routes ductwork and piping while being object aware and missing the Beams and other MEP information. Currently the user tells the tool which pieces to connect, and it routes missing the structural/MEP information. Rather imagine feeding the computer the load requirements, room types, etc., and the computer algorithm autonomously designing, routing, and modeling the MEP information. What will be the time saved during the 3D coordination process when the GC is involved? What happens when the subs have this same technology? I think we will see this technology within the next three years. Manual analysis and modeling is going away. GRAITEC Advance BIM Designer Collection has already created a tool that is a design-driven reinforcement calculation program for 3D cage modeling and automates documentation production for reinforced concrete columns, beams, and footings. It’s just a matter of time before this tool becomes mainstream. Imagine in the next five to ten years, structural analysis having a more direct influence on architectural design. It already does today, but with advances in material science, biomaterials, and algorithmic modeling, we could see extremely efficient structural buildings with half the material. My good friend Nate Holland at NBBJ executed an incredible process as part of his thesis in college. He built an algorithm that optimized his building to increase revenue at a rate greater than cost by maximizing retail space, ocean views, and floor plates. The premise is to create an integrated team, the designer and the computer. Together the designer can feed the computer a series of rules, requirements, and parameters. The computer can then return a list of options that meet that criteria based on the parameters set by the designer. 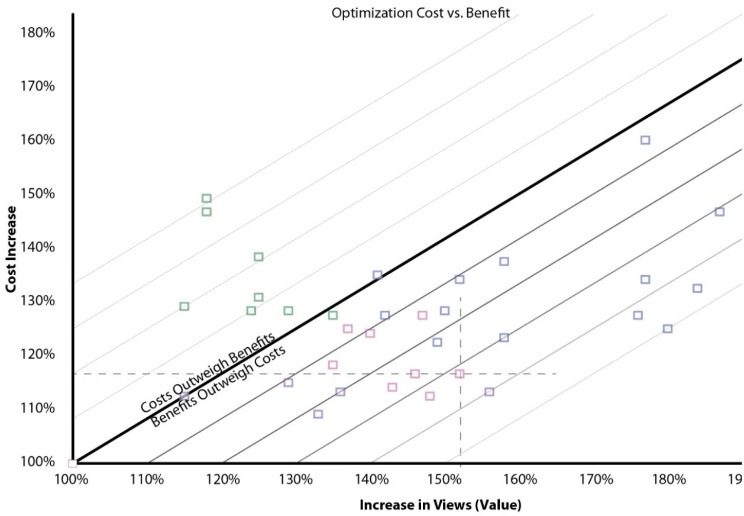 With the below graph we can see where each design falls in relationship to costs outweighing benefits and benefits outweighing costs. Nate’s algorithm uses a tool called Galapagos that assists in the optimization of the building. There is a tool that was created for Dynamo with similar functionality called Optimio. It’s in the early stages of design, but with more and more tools like this we can expect to see more optimization not less. In the future, I imagine a tool or likely a series of tools that take all the international codes, the rules set by the designer and engineer, and creates a series of optimized options based on the desired constraints. Similarly, these design tools will take other factors into account, such as daylighting analysis, heating and cooling loads, glazing percentages, etc., and help us to design more sustainable buildings. What is the process we use now for sustainability? We manually design a building using our software of choice, “gather data,” and adjust accordingly using a manual modeling process. Repeat. What if we fed the computer our model, and asked the algorithm to optimize our daylighting? It could analyze, modify, analyze, modify, analyze, until it found its optimal form to maximize the daylighting of the building in relationship to the coordinates and the sun. There are already algorithms that can do this. It’s just a matter of time before they are intuitive enough for the majority of design professionals in our industry to use them. I personally believe the reason option engineering has not taken off is because the software is not as intuitive as sketching tools like Sketchup, so designers don’t want to use it. I believe teams like project fractal are helping overcome this. You can’t talk about the future of our industry without touching on VR/AR. In the future, we will not have to choose between virtual reality and mixed reality headsets. The headsets of the future will have lenses that will be able to accommodate both virtual reality and mixed reality. Additionally, as the hardware becomes lighter and more comfortable, we will wear them throughout the day and not only when we want to see a rendering. Expect to see hybrid VR/AR headset within two years. With additional accessories that allow us to experience pressure, temperature, and smells, it will be much harder to decipher the virtual from the actual. How Will Robots Drastically Change the Construction Industry? Will the robots of the construction industry look like the robots of the food industry? I believe robots of the future will look more like machinery than they do people. Robots certainly can’t do a lot of the same tasks that humans do such as navigating a construction site, right? Uber has invested heavily in self-driving cars that navigate city streets with pedestrians and other civilians in their own vehicles. These self-driving cars have object avoidance algorithms that are fed information from sensors mounted to the vehicle. It is only a matter of time before robots are working side-by-side with construction workers. Robots are already showing up in construction. Below is a robot that is helping pavers lay pavers more efficiently (and save their backs/knees). The workers feed the bricks to the top of the robot, and the machine robot lays the bricks in the desired pattern. Arch_Tec_Lab is a test facility for Robotic Fabrication in Architecture located in Zurich, Switzerland. The facility is currently prototyping robots and their use in construction. The thought behind the facility is to not be limited by a two-way path similar to auto construction, but rather be completely free to assemble complex forms using the 40-axis of movement of the robotic array. SAM, (Semi-Automated Mason) is a robot designed to make construction work a more efficient process. Costing half a million dollars, its creators claim that SAM can lay between 800 to 1,200 bricks in a single day — a skilled human mason tends to top out at 500. Hadrian line of bricklayer robots claim that their robot can lay 1,000 bricks per hour! 3D printers are now leaving the office and building on-site to scale. With the advent of 3D printing and material science, we are going to see more unique buildings in lieu of the traditional boxes. This is because from a labor standpoint it will not cost any more to build a rectangle than an oval. Drones are quickly finding their place in the construction world. This is nothing new. They help with more efficient job walks, less injured employees, etc. However, did you know they are helping now with the actual construction process too? A team from Gensler in Los Angeles has launched a 3D printing drone prototype. Their goal was to resolve the traditional issue of 3D printers, the size of the print bed. It also helps where a construction site might be hard to get materials to. Architect Ammar Mirjan programmed together a small collection of drones to fly hundreds of blocks into a formation to build a six-meter-tall tower. It was a first for drones. All in all, robots are drastically faster than humans and they never get tired or injured. They will never file a worker’s compensation claim. Construction accounts for one-fifth of all U.S. worker deaths on the job. This is only in the U.S.! In 2014 the government counted 870 construction workers dead. If you combine robotics, construction, and the Internet of Things (IoT), this is where it gets exciting. Like the Uber car never running into other objects, imagine if drones and machinery were object aware and could not run into humans. Our team currently uses a technology called photogrammetry. We have a camera that ties into the IoT. Based on a WiFi signal given from the camera, we can control the camera using the iPad. It’s a pretty cool technology, and general contractors specifically are loving it. Imagine if you could send a team of tiny drones to scan a property rather than a human having to lug around a heavy camera on-site? I anticipate we will see this technology in the next three to five years. How can you best prepare yourself and your firm for these changing processes? Getting upset about jobs is not going to solve anything. Instead, start getting into the technology! Bill Allen is the co-founder and Chief Technology Officer at EvolveLAB, a progressive computational design and Building Information Modeling company located in Boulder, Colorado.